It’s hard to describe the taste of a lava-toasted marshmallow. If you bronze it gently, then it tastes like any other semi-molten marshmallow, but if you hold it closer for some light charring, the lava imparts a distinctively earthy flavour. This unique taste of mother nature can be found standing in a lava field on the northwest flanks of Pacaya Volcano, Guatemala. If you’ve ever dreamed of getting up close and personal with a live volcano, this is a great place to take a half-day excursion out of Antigua. Pacaya Volcano (Volcán Pacaya in Spanish) is one of the most active of Guatemala’s 37 volcanoes. It has been erupting almost constantly since the early 1960s, ranging from explosive lava fountaining to just blowing off the occasional steam and gas. If you recall grade ten science class, then you might know something about the Pacific Ring of Fire. Guatemala is located on the Ring of increased volcanic and seismic activity which is caused by the movement of tectonic plates. More specifically, Guatemala lies where the Cocos Plate is slowly diving underneath the Caribbean Plate, creating pressure that is released through volcanic activity and earthquakes. Your experience of Pacaya Volcano will depend largely on its recent activity. Before you plan a trip, check the latest activity reports from the Smithsonian Institute and/or Volcano Discovery. There are times where it is too dangerous to climb the volcano and periods of lapsed activity where there isn’t much to see, so chat to your tour provider about current conditions and what to expect. Note, you won’t be hiking anywhere near the very top of the Volcano, the crater is too active to get that close. Tours out of Antigua are generally 6hrs including the three-hours return drive to Pacaya Volcano National Park (Parque Nacional Volcán de Pacaya) visitors centre at San Francisco de Sales, and roughly 3hrs of hiking. Tours are generally offered twice per day – morning and afternoon (sunset). We took a USD10 tour (plus Q50/USD7.20 National Park entry) with a local agency. At 2pm they crammed us into a van full of other intrepid folk and we made the drive out to the Pacaya visitors centre. There we began our 7km return hike on a leafy trail bordered by local farms and bushland. An hour or so and 460m (about 1500ft) in elevation gain later, we took our first steps out onto the moon-like lava field. The hike itself is challenging, particularly if like us, you are a sea-level dweller of low to moderate fitness. The trail is steep and the pace is determined by the impending sunset (and the amount of traffic on the way out to the Volcano). In our case, there were a few very short rests – enough to gulp some water and catch our breath. Up until we reach the lava field, the trail is a mixture of concrete/stone steps and dirt slope. Once out on the field, we’re slipping and sliding on the loose scree and balancing on the crusty chunks of solidified lava. Finally, we stood next to a rambling lava flow, though I feel that the word “flow” really gives the wrong impression… Back to grade 10 science and you may remember there are two major categories of lava. Pacaya’s basaltic ejections fall into the Aa (pronounced “ah-ah”) category. 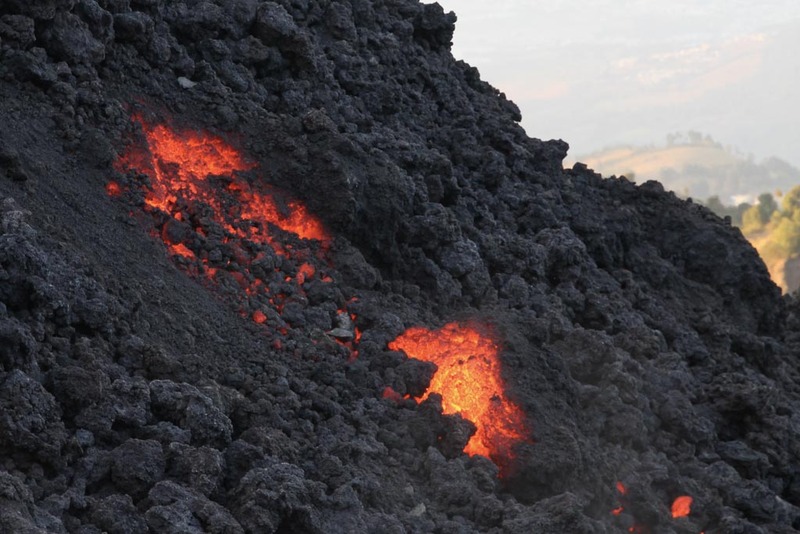 Aa is the sharp, rough type of lava that makes you say “ah-ah” when you touch it! It cools quickly and breaks into large crusty, angular chunks. From the lava field vantage point we see fresh lava pouring out of the crater. It becomes more visible as the sun gets low and the lava glows against the shadowed mountainside. Where we interact with the lava it is moving slowly, creeping forward, sending small boulders tumbling down it’s face from time to time. As it moves, cracks open up revealing the red-hot lava still burning away underneath the cooled surface. Heat radiates off the flow as we roast marshmallows on a slither of glowing red. The heat is countered by a cool wind that whips around the upper volcano slopes. As the sun nears the horizon, our guide led us to viewing point away from the moving lava. Fuego, Agua and Acatenango Volcanoes loom in the distance creating a beautiful backdrop for closing day. As soon as the sun has fallen below the horizon, we are making rapid tracks back down the volcano. There is just one stop on the way down to snap some photos of city lights and volcano silhouettes against the last whisper of light on the horizon. The glow disappears quickly and we are reliant on flashlights and headlamps for the rest of the trek. If you usually reside at sea level, give yourself a couple of days at altitude before taking on the Pacaya Volcano hike. Our guide spoke only Spanish, so there was no great informative lesson to be had from our tour (we only paid USD10 after all). If commentary is important to you, ensure you book a guide that can communicate in your preferred language. Conditions vary constantly – make sure you check those aforementioned websites to get an idea of volcanic activity or talk to your tour company. The National Park visitors centre has bathrooms and snacks/drinks available. Our tour included marshmallows and bamboo skewers for roasting, however, I have read that some do not – check with your guide. If not, you can purchase them at the visitors centre before you set out. There are kids selling wooden walking sticks for under a USD1 and even horses available to hire for under USD15 to help you up the trail if you are not feeling up to the steep trek. Several horses will follow your group up the first section of trail, so you can test the waters first and see if you want to continue on foot. If you decide to go sans sticks, know that your first instinct upon reaching the lava field will be to grasp the rocks beneath you to steady yourself. Those lava chunks are sharp and potentially hot so it’s best to tuck those abs and try to choose your foot placement carefully, testing each rocks stability before putting your full weight on it. Take a small day pack with plenty of water, snacks, flashlight/headlamp and a camera. Wear long pants, sturdy hiking boots or trail shoes and take a jacket, preferably one that is waterproof, especially in wet season. Find flights to Guatemala City with Skyscanner. Is climbing a live volcano on your bucket list? Have you done it before? Tell us in the comments below. This trip looks amazin, 100% one for the bucket list – and something I’d never have thought of myself!